Homeschooling a child with ADHD can be both extremely rewarding and exhausting. Here is my list of tips and advice to make your homeschool journey easier on you and your child. 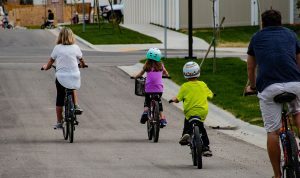 Kids with ADHD struggle to keep straight days of the week, and patterns of what will happen when, more than most kids. 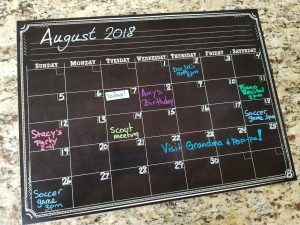 Having a very large calendar where you can note every co-op class, scout event, dance class and soccer game can help your child feel prepared for their week. Remember to cross off days as they pass or otherwise help your child find the correct day regularly. Having a reminder which is visible throughout the day that the child has soccer this afternoon can help them focus on finding their shoes or completing their chores before it is time to go. 2. Post a daily or weekly schedule. Establish a rhythm to your week for which subjects you’ll teach and other activities. How detailed this schedule should be depends on your family. Do you rotate subjects or do the same ones each day? Do you have one day that you switch things up or go to co-op every week? If you have multiple children, you may need to post a schedule for each one. Having a list for each day of the week such as this one. 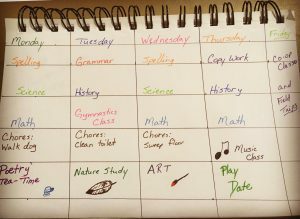 A schedule like this can help your child see what is coming, and be more prepared to do today’s subjects. They can also clearly see that the things they want to do are on the schedule right next to those they like less. Whatever your child’s strengths, be sure those are on your weekly schedule, even if that means you are writing in recess each day. 3. Find ways to let kids move during lessons. A child with ADHD often needs to be doing two or more things at once. By providing a way for them to use their bodies while working you will actually help them to focus better. Their bodies actually need to move to help them focus. What can you do to help? While reading or lecturing them give them play dough or blocks to play with or have them color or draw what you are talking about. Trade your desk chairs out for yoga balls so the child can bounce while they work. Offer crunchy snacks during lessons like carrots. The muscles in the jaw are some of the strongest in the body and engaging them can help a child focus on other things. 4. Engage them in science, history, cooking or art projects. Children with ADHD often have an area where they excel. Give them the room and resources to explore what they are good at. Sometimes, more complicated activities are actually more engaging than simple ones. 5. Skip things that will only result in misery. That’s right, I am giving you permission to just skip some stuff. The curriculum you are using has a tedious game or writing assignment that you know will be miserable for you and your child? Skip it! Or substitute something else. It is even okay if you need to take a break from an entire subject or throw out a curriculum that isn’t working. Even with a neuro-typical child, there are things that don’t work and are a bad fit. Find resources that work. If they only work 90% of the time, skip that last 10% that doesn’t work. 6. Make recess and physical education part of your daily schedule. Research demonstrates that humans learn more and retain more information with frequent movement breaks. Kids need to play and use their bodies. Take breaks as frequently as possible. As a species, humans are just not made to sit still but sometimes even kids need a push to go move. 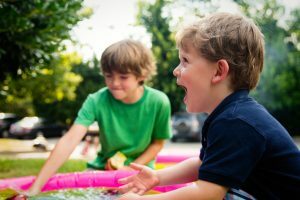 If your child isn’t inclined to “just go play”, make a list of possible activities as suggestions. You should also have a list of things you can do with your child and do movement activities with them a few times a week. Your list might include walking the dog, going for a hike or bike ride, or playing catch with a ball. Teach your child games from your childhood or ask Pinterest what you can do with 3 pool noodles and a box of sidewalk chalk. I’m sure there’s something. Physical activity is good for you, too. And seeing you want to play and move around will help motivate your child with ADHD. 7. Put on music while you work. Having some music playing in the background can often help kids and adults with ADHD to focus on the task they are doing by engaging part of their brain. Finding the right music for your child may take some time. I recommend starting with classical music such as Mozart or other instrumental music so that the lyrics don’t become a distraction. Music lyrics are some of the most engaging series of words possible, so they are likely to pull your child’s attention away from their task. Streaming music services like Pandora and Amazon Music often have playlists of classical music specifically curated for helping you study. 8. Be kind to yourself. 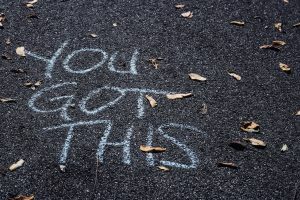 Parenting and teaching a child who is not neuro-typical is challenging and not for the faint of heart. Give yourself breaks and rewards. You are doing a hard job. Respect that and pat yourself on the back for it! Next: Next post: Magic Monday: Bears and Leaves!